The ambient temperature sensor is installed in the front part of the condenser to detect the ambient temperature and control the air conditioner. 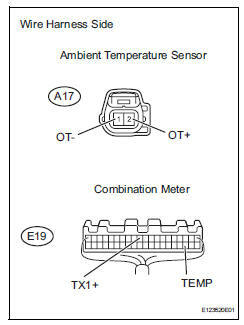 The sensor is connected to the combination meter and detects fluctuations in the ambient temperature. 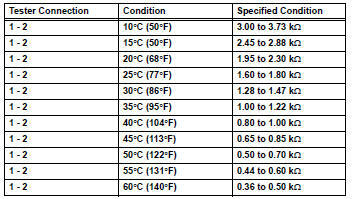 This data is used for controlling the room temperature. The sensor sends a signal to the air conditioning amplifier via the combination meter. The resistance of the ambient temperature sensor changes in accordance with the ambient temperature. As the temperature decreases, the resistance increases. As the temperature increases, the resistance decreases. The air conditioning amplifier applies a voltage (5 v) to the ambient temperature sensor and reads voltage changes as changes in the resistance of the ambient temperature sensor. 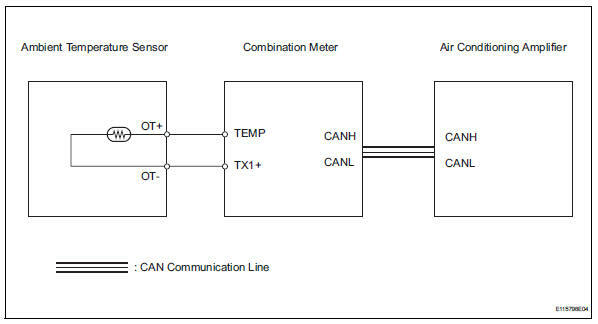 The combination meter sends the read signal to the air conditioning amplifier via can communication. Remove the ambient temperature sensor. 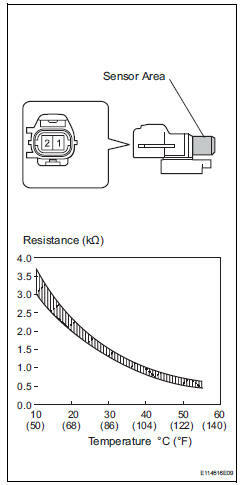 Touching the sensor even slightly may change the resistance value. Be sure to hold the connector of the sensor. Disconnect the a17 sensor connector.